This product is updated at approximately 5 AM, 11 AM, 5 PM, and 11 PM PDT from May 15 to November 30, with special outlooks issued at any time as conditions warrant. The graphic displays all currently active tropical cyclones, and disturbances with tropical cyclone formation potential over the next 48 hours. Mousing over the symbol for each weather system displays details for that system; clicking on disturbance symbols or numbers toggles a zoomed view on or off. For additional NHC products on active tropical cyclones, click on the tropical cyclone symbols. 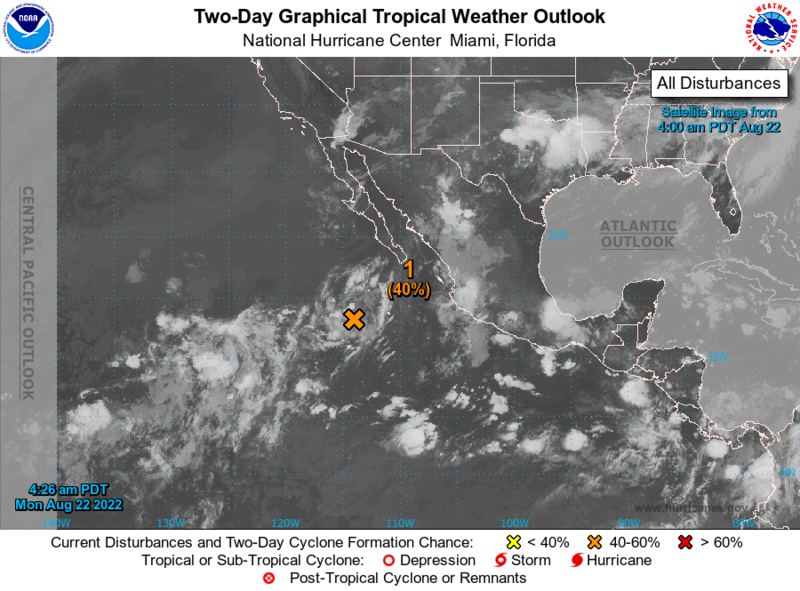 Tropical Weather Outlook that will be issued on this system. * Formation chance through 5 days...low...near 0 percent. will be issued as conditions warrant.